I just recently bought Ariat’s Scout Chaps. These are Ariat’s newest brand of half chaps. (They also have similar boots but I haven’t gotten them yet.) The verdict? I love them! 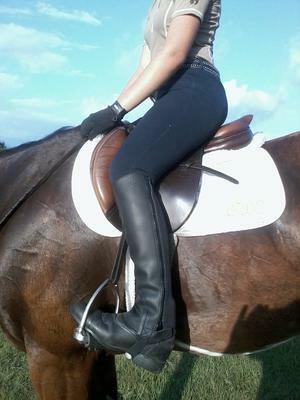 I like to wear half chaps during my lessons. They help to give me extra security in the saddle, especially when I am jumping. Not only are the chaps beautiful crafted they are also highly functional. They have a beautiful wax leather that is waterproof, a great suede inner panel that provides an amazing grip on the saddles, and an elastic gore that help these chaps mold to your calfs. And to sweeten the deal even more, these chaps are very economically priced. Like other products by Ariat I have tried, I have found these chaps to be extremely comfortable and very durable. So far the chaps are holding up nicely, plus they are easy to get on and off. (No need to ask someone to help me zip up chaps with zippers in the back!) They are great for everyday wear. 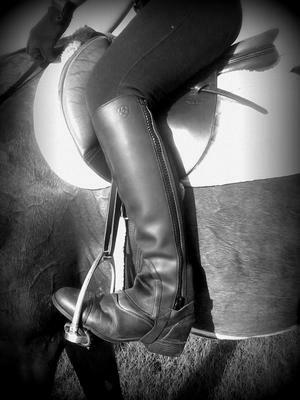 They also do not pop up over the back of my boot like some of my other half chaps have done in the past. Plus the elastic gore is extremely durable and is holding up great; it does not seem like the kind that is going to easily rip. The suede is easily cleaned too all you have to do is brush it off with a hard brush. How easy is that? This leaves only a little bit of leather left that needs to be cleaned. Overall, these are great chaps at a superb price, especially for an Ariat product.